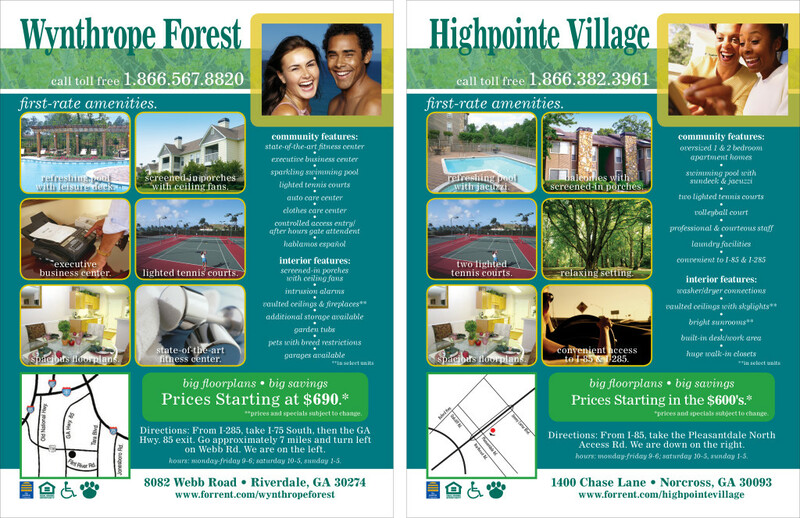 Harbor Group Management wanted to create a series of ads for all of their Atlanta-based properties that were bright and stood out from the hundreds of other ads in For Rent Magazine. The ad also needed to accommodate six location photographs, a rotation stock photograph, and a large list of features for each of Harbor Group Management’s properties. Using bright greens, teals, and yellows, I was able to create a tasteful but eye-catching layout that utilized rounded corners over the traditional box to further boost the ad’s viewership. By highlighting certain amenities through the property photographs, I was able to create space for the other amenities provided by each community. The client was very pleased with the overall look and received a lot of positive feedback from prospective renters.